There is a magic about Cambodia that casts its spell on many that visit this charming, unique yet confronting kingdom. Ascend into the realm of the gods at the mother of all temples, Angkor Wat, a spectacular fusion of symbolism, symmetry and spirituality. Descend into the hell of Tuol Sleng and come face to face with the Khmer rouge and the killing machine. Welcome to Cambodia...a country with a history both inspiring and depressing, an intoxicating place where the future is waiting to be shaped....the kingdom of wonder awaits you. 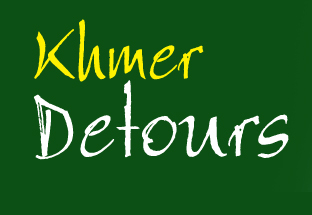 All our tours or should we say detours have been designed to show you the real Cambodia. From the chaotic yet charismatic capital of Phnom Penh, to the beaches of Sihanoukville, the chilled out and relaxing Kampot and trekking up Bokor mountain, elephant riding in jungles of Mondalkiri Province, ogle the Mekong dolphins at Kratie, to the awesome temples of Angkor Wat and further out temples we have the lot. Heaps to see and do and all available right here, if we do not have a tour or itineraries to suit you than just let us know and we can tailor them to make a special tour for you. Provide fair pay and conditions to all employees. Provide training and education for employee benefits, including but not limited to basic first aid training, computer studies, language skills and studies, advanced driving skills, marine and boatpersons skills, customer service and other skills as required. Provide meals and accommodation as required. Employment of all local staff as much as possible. No employee to work longer than 40 hours a week. Paid sick leave, maternity, holiday and special family leave, all public holidays or leui of, by the way of other days off or compensation. Provide support to all employees and their families as much as possible. Equal pay and skills training. Only employ adults 18 years or older. Employment of Khmers, Cambodian company for Cambodian people. As part of our commitment to occupational health and safety we require all staff to attend a monthly safety meeting. In General we have set up the company to select and conduct tours for the enjoyment of our customers and at the same time ensuring we run fun, educational, environmental friendly sustainable tours. We have kept the prices down as much as possible without skimping on sites visited or service. We do not expect to make a profit however if any profits are made we can use this to create more tours and employment for more local people together with training and education of both employees and their families. Ensure the customer receives the best service and commitment as outlined in our tours. Ensure the customer is at all times safe and do our upmost to ensure they are well looked after. Give the customer what they want, be flexible, patient and caring to the customers needs and wants. Ensure that our General Manager is available at all times or his/her assistant is to deal with any problems or issues that may arise from time to time. Treat all customers equally, with respect and with the mindset we are here to ensure their well being and enjoyment. If a customer needs advice or help outside our tours we must ensure we can offer them assistance whenever possible. Avoid exposing the customers to any scams, rip-offs or unsafe practices. Advise our customers of any special clothing or protection required for different locations. All of our employees are full time long term employees and are selected on their talents and skills, but more importantly they are very nice people. All have police clearance and all come from well respected families. Relatively speaking they are all well paid and their conditions of employment are exceptional for Cambodia; however one thing we do not, have not or will never tolerate is any types of scams, rip offs or tricks. We have a zero tolerance for these practices - even asking customers for a tip is not on - nor is accepting any secret commission from suppliers. As a guest you can be assured our guides will not expose you to any of these practises.